The Darien collection of occasional tables offers the Rectangular End Table 1124-03 that gives you style and functionality. A drawer and shelf offer room for storing remotes, books, and other clutter or for showing off your favorite art pieces. Finished off with bold silver accent hardware and leg caps, this end table is sure to add a statement to your living room. The Darien Rectangular End Table with One Drawer and Shelf by Magnussen Home at AHFA in the area. Product availability may vary. Contact us for the most current availability on this product. Contemporary lines and innovative features are combined with classic styling to create a unique collection of occasional tables that are both stylish and functional. Perfect for use in your living room, the Darien collection will make a bold statement in your home. 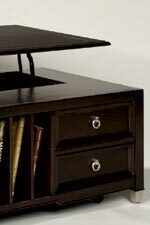 These tables are constructed out of hardwood solids and ashes veneers in a rich, dark Burnt Umber finish, and are accented by bright nickel hardware and leg caps that add a definitively modern twist. The Darien collection is accented with unique function and shapes that are hard to find in other occasional tables. Features include a pie shaped cocktail table and a rectangular cocktail table that have lifting tops so that food or drinks are at a convenient height during parties or when eating by the couch. You can also highlight your entertainment area with the handsome, classic look of the Darien entertainment wall. The Darien collection blends contemporary lines and more traditional looking drawer pulls to create a line of furniture that is transitional and easy to match to any style of home. The Darien collection is a great option if you are looking for Transitional Casual furniture in the area. Some pieces feature lifting top, magazine rack storage, and castors for mobility. All pieces feature silver accent hardware and leg caps. Browse other items in the Darien collection from AHFA in the area.